Doors open at 5:00PM; movie starts at 7:00PM – come early and stay late – seating fills up quickly! Free Admission! Raffles/Prizes/Ski Giveaway … all proceeds benefit The Elisa B. Hughey Scholarship Fund. Acclaimed writer/director Ben Sturgulewski joins the award-winning team at Matchstick Productions and their two decades of filmmaking expertise to deliver “RUIN AND ROSE,” an epic creative vision brought to life by the talents of the world’s top skiers. Winter landscapes across the planet contrast seamlessly with a thoroughly-crafted story of environmental apocalypse, shot entirely within the otherworldly expanses of Africa’s Skeleton Coast. Unlike anything seen before, the dreamlike setting of this film sparks the imagination of not only action sports enthusiasts, but anyone with a beating heart. 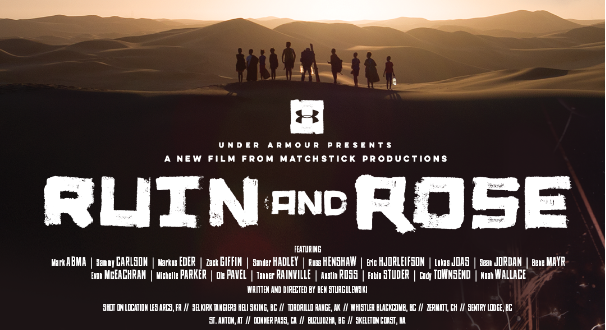 Presented by Under Armour in spectacular 4K resolution, “RUIN AND ROSE” features veterans and newcomers alike, including Mark Abma, Sammy Carlson, Markus Eder, Zack Giffin, Sander Hadley, Russ Henshaw, Eric Hjorleifson, Lukas Joas, Sean Jordan, Bene Mayr, Evan McEachran, Michelle Parker, Ole Pavel, Tanner Rainville, Austin Ross, Fabio Studer, Cody Townsend, Noah Wallace, and others. “RUIN AND ROSE” was filmed on location in Alaska, Austria, British Columbia, Bulgaria, California, France, Switzerland, and the deserts of Namibia. ← End of Season Sale!